Had the itch for burgers, so mixed up some Bourbon, Brown Sugar and Butter in with some 80/20 and smashed it on the Cast Iron Skillet for a bit. 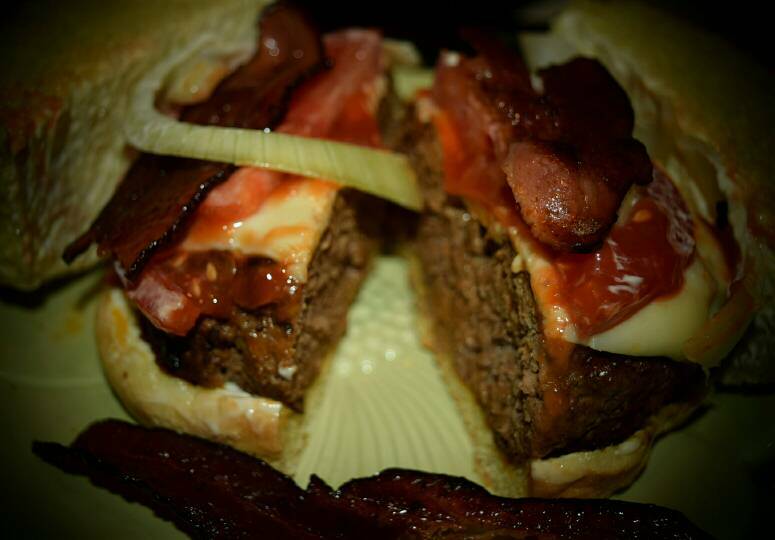 Tomato, Onion, Ketchup/Mayo, Smoked Bacon,Havarti & Cooper Cheese on an Italian Roll..
Man that meat looks soooo good. Rest is is purdy as well. Yes please. I think we're having Burger King tonight ?? Lol. Now that is my kind of burger. Say OUP, how come it's ok to cook a burger to this doneness, but not a steak???? That is a dang good looking burger WV!!!! Thx, it was FULL of flavor, BUTTTTTT... I WON'T be making this the same way again. Again, it was really good, but ....let's just say it came with consequences..lol.. I'm not sure if it was the Bourbon or the Brown Sugar / Butter, but it was a rough night so I suggest Steering Clear of duplicating this. I bet it was fine. Personally, I don't care for sweet anything when it comes to beef. Think it just goes with pork better. I bet it was fine. Personally, I don't care for sweet anything when it comes to beef. Think it just goes with pork better. [/quote]Umm..., It wasn't fine, lol... It gave me the Motsies lmao. It wasn't too sweet actually. I do however know what u mean about too sweet with beef. outlaw wrote: Say OUP, how come it's ok to cook a burger to this doneness, but not a steak???? Succinctly put, but I'm still not buying it. Lol, I had a double cheese whopper. Yours looked twice as good, and prolly tasted twice as good too. Great pics.....again. Better than my I pad takes,lol. Russ[/quote]At least BK didn't rattle my insides, lol..
As for the pics, the Russ. Speaking of the camera, you should see the ( gadget ) I bought for taking close up pics. When I say close up, I'm talking pinpointing fibers on a piece of hair! They are called Lens extenders. They are a ( cheat ) used instead of spending $$$$$$$$ for a good macro lens. Usually in a pack of 4. U can use just one, or stack all 4 together.